From the Cumberland Gap to the Atlantic Ocean, this is Virginia Water Radio for the week of January 20, 2014. This week we feature another mystery sound. Have a listen for about 15 seconds, and see if you can guess what’s making the squawking and warbling sounds. And here’s a hint: Even though this bird is a diver and not a dabbler, its beautiful color and its name may interest those of you who dabble in art. If you guessed a Canvasback, you’re right! Canvasback ducks winter in the Chesapeake Bay and along the east. West, and Gulf coasts of the United States, but they migrate to prairies of Canada and northern states for spring and summer. 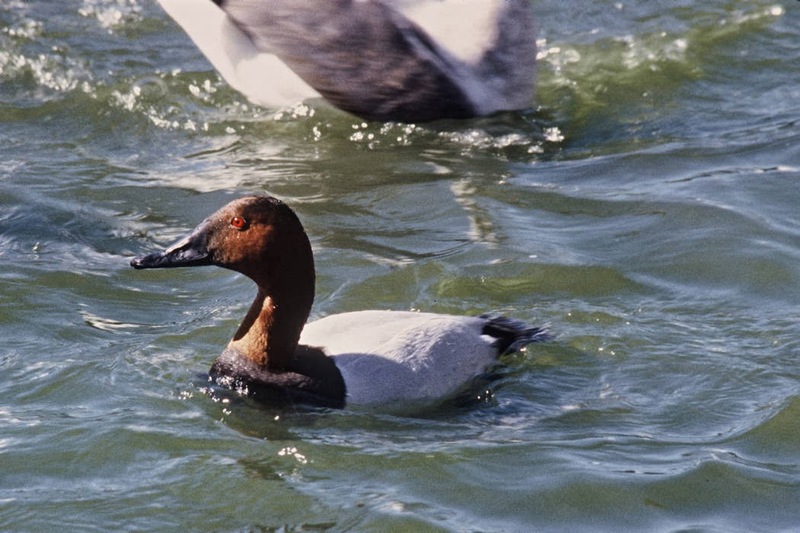 Male Canvasbacks are recognizable by their red head, red eye, black breast with white body, and relatively large size. Canvasbacks are diving ducks, meaning they typically go completely underwater to obtain food and avoid predators. Some other diving ducks found in Virginia are the Bufflehead and the mergansers. In contrast, dabbling ducks typically feed from the water surface and don't usually submerge themselves. Some examples of Virginia dabblers, also called “puddle ducks,” are the Mallard, Black Duck, and Wood Duck. Thanks to Lang Elliott of NatureSound Studio for permission to use this week’s sound. Canvasback (Aythya valisineria). Photo by Lee Karney, made available for public use by the U.S. Fish and Wildlife Service's National Digital Library, online at http://digitalmedia.fws.gov, accessed 1/17/14. Acknowledgments: The sounds of the Canvasback duck were taken from the Stokes Field Guide to Bird Songs-Eastern Region CD set, by Lang Elliott with Donald and Lillian Stokes (Time Warner Audio Books, copyright 1997), used with permission of Lang Elliott, whose work is available online at http://www.langelliott.com/ and the “Music of Nature” Web site, http://www.musicofnature.org/. Emily Whitesell helped write this week’s show during a Virginia Tech English Department internship with the Virginia Water Resources Research Center in the Spring 2011 semester. This episode’s sounds and information were previously used as part of a longer-format episode, #50 (week of 1-24-11); that episode’s audio has now been archived. Sources: Information on Canvasbacks was taken from A Guide to Field Identification of Birds of North America, by Chandler S. Robbins et al. (New York: St. Martin’s Press, 2001); Life in the Chesapeake Bay, by Alice Jane Lippson and Robert L. Lippson (Baltimore: The Johns Hopkins University Press, 2006); and the Cornell University Lab of Ornithology’s “Bird Guide” Web site at http://www.allaboutbirds.org/guide/search. Another good source of information is “Birds of North America Online” at http://bna.birds.cornell.edu/bna (please note that a subscription is required to use this service). *E-bird Web site at http://ebird.org/content/ebird/, maintained by the Cornell Lab and the Audubon Society (here you can find locations of species observations made by contributors, and you can sign up to contribute your own observations.